Hi - I'm new to the forum, but wonder if anyone can give me a bit of help!! I've only been connected for about 3/4 weeks but haven't managed to get a consistent connection. Sometimes when I turn on my computer, I can only access a Local network, which means I cannot access the Internet (Local and Internet Network). I have to pull out my Ethernet cable from the back of my computer and the grey modem cable, and wait for the Internet light on the router box to come back on, and by which time, I might have gained access to the Local and Internet network. It sems like the connection is there, somwhere, but the computer is not finding the right connection, or the connection is intermittent. I have updated my Ethernet driver, and reset my router box. My computer doesn't have a wireless adapter card in it, so the system shouldn't be trying to connect via 'wireless'. I can't keep unplugging wires for the next 11 months and would to be able to have access, once my computer has warmed up!! You want to be using the the 'LAN or High speed internet connection'. You can probably disable the WAN Miniport without any consequences if your computer is just connected to the router via an ethernet cable. You say it takes a while once you turn your computer on to get internet access, do you turn your router on at the same time or do you leave it on all the time? I takes a minute or 2 for the router to sync with the exchange then get an active internet connection each time it is turned on, you won't be able to access the internet until these 2 minutes have passed and the 'I' light is on on your router. With regard to problems access other computers over the LAN, make sure that every computer is set to obtain an IP address automatically. To do this, right click on the connection (LAN or high speed internet connection) and select properties. Select 'Internet protocal (TCP/IP)' and select properties. Ensure 'Obtain an IP address automatically' and 'Obtain DNS server automatically' are selected. You should really have your router on before any computers are turned on otherwise they might not pickup the correct IP address from it when they boot (they may choose a self-assigned IP address starting with 169.). If you do turn on a computer after the router and are having problems connecting to other computers or the network, open up a command prompt (Start > run > type 'cmd') and type ipconfig /renew. This will force the computer to obtain a new IP address from the router. If all computers have the right IP addresses there shouldn't be any problem communicating between them. If you have any firewall software installed on your computers, you may need to allow the other computers through it. To do this set a zone (or whatever it is called by your firewall) that lets through addresses 192.168.0.1 to 192.168.0.100 (assuming 192.168.0 is your network address). This will let all other computers on your network connect to the computer with the firewall (you will have to make this setting on each computer). My router box is kept on all the time, only because I didn't know you could turn it off - I don't switch off my computer, at the back either, just shut down etc. The 'i' light, and the others are usualy on. I also seem to have 2 Internet Protocol versions: Version 4 & Version 6, Both are ticked though, and the conditions you mentioned below are enabled. I only have the one comuputer, and with the router box being left on all the time, wouldn't have thought it would take that long in order the the computer/box to register a connection? It seems that the only way I can get a connection, is if I reset the box, or remove cables and plug them back in. Are you running in the master socket or an extention? Unfortunately, I have to use an extension, as my master socket is in my living room and the computer is in my dining room. I have also had to use an extension lead from the box to the router, as the cables are not long enough from the phone extension to the computer. My connection is: extension box(on the wall); extension cable; microfilter; phone and router cable to Netgear router. I have changed the microfilter this morning, and at 5:10pm have a connection, but cannot be sure this wasn't because I pulled the cables out of the old microfilter (which is normally how I can get a connection). I am afraid your extensions are causing most of your problems. Especially the plug-in one. These are very bad news for broadband connections. If you can possibly manage it you should plug the router into the Master socket and connect to your PC with an ethernet cable. These can be bought in any length up to about 100m from stores like Maplins. You may also be able to improve things by disconnecting the 'ring' wires from terminal no3 in the master socket and the slave socket. Thanks guys for posting back. My main socket is in another room, so isn't really feasible to plug the router in there. Though I did think that the extension thing would become an issue. I do have a filter on my main socket, which has my Sky box connected to it. Maybe I need to look at having another socket put in, which would bypass the extension. Does anyone know how much this is likely to cost? 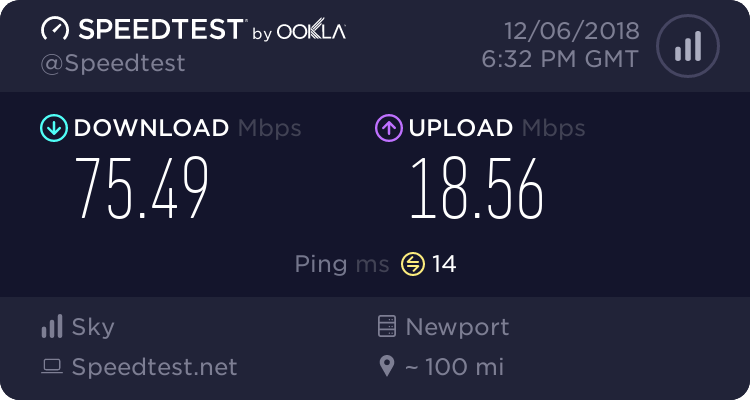 I used to use an extension cable with my previous ISP and never had an issue, then moved to sky and all hell broke loose, now using an expensive shielded cable from the filter to the router with the filter plugged directly into the master test socket and my connections still drops in excess of 50 times a day and probably stays up for no more then 2 hours at a time max (not very frequently though), so im not sure the whole extension thing stacks up properly.